Rapper and producer Tricky is a pioneering force in British dance music culture, with 11 idiosyncratic studio albums to his name. Known as a key player in Bristol’s burgeoning ‘90s “trip-hop” scene, his distinctive, rasping flow, and fluttering beatwork has influenced countless acts in both the UK and abroad. 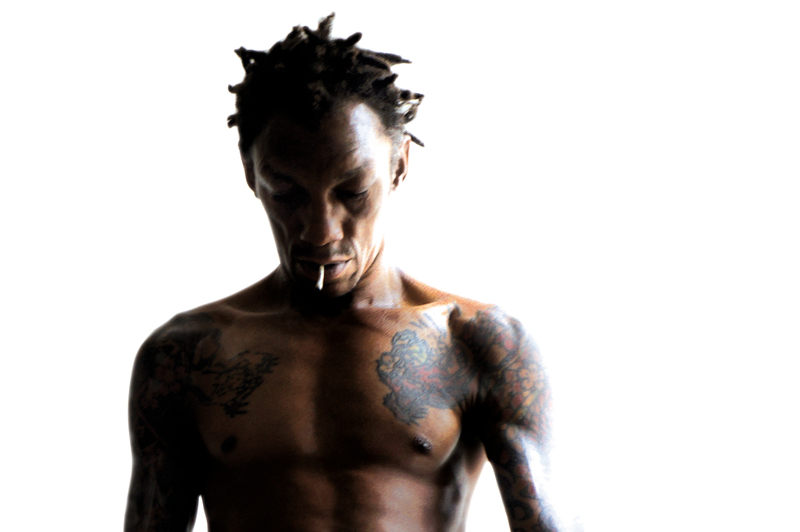 Tricky cut his teeth as part of Bristol troop Massive Attack at the turn of the ‘90s, featuring on the group’s 1991 debut Blue Lines, and showcasing a formidable vocal dexterity on the album’s title track. The rapper’s agile, yet relaxed lyrical approach was the embodiment of the detailed, downtempo style which would come to be known as trip-hop, alongside fellow Bristolian acts like Portishead. It was, however, as Massive Attack and Tricky went their separate ways that the artist came into his own with debut Maxinquaye, a singular collection which would become era-defining shortly after its 1995 release. Maxinquaye’s confidently drew upon influences from rock, classic hip-hop, and dub, bound together by Martina Topley-Bird’s ethereal vocals, and Tricky’s stoned, breathy flow. Taking on Public Enemy with the cover “Black Steel”, and working with Cure producer Mark Saunders, Maxinquaye carved out a confrontational, yet melancholic sound which Tricky would explore to critical acclaim in an astonishing run of albums in the decade’s remainder. 1996’s Nearly God and Pre-Millenium Tension, and 1998’s Angels With Dirty Faces contain some of the artist’s most accomplished moments, notably the collaborations “Yoga” (with Björk), “Lyrics Of Fury” (with Rakim), and “Broken Homes” (with PJ Harvey), which range from the furious to the paranoid. Though Tricky’s output has rarely captured the scintillating energy of his first four albums since, he remains highly respected, not least as a notoriously outspoken figure in a music industry increasingly prone to bland conformity. The sexual ambiguity Tricky has courted since his provocative pose on Maxinquaye’s cover can be seen as a forerunner to the androgeny of contemporary acts like Arca, while his 2013 album False Idols unflinchingly sought to take the wind from the sails of figures as high-profile as American president Barack Obama. Most importantly, his musical legacy lives on, and in Mancunian producer Andy Stott’s remix of False Idols cut “Valentine”, Tricky’s foggy, challenging musical style appears to be in safe, and indebted hands. Watch the music videos of the week featuring Miley Cyrus, Tricky, Nick Minaj, Iggy Azalea and many more. It's EB Premiere time! Listen to an exclusive album stream of the tenth Tricky album False Idols, right here on EB. Editor-in-chief Max Dax talks oblique strategies and chance procedures with the fast talking and even faster thinking Mark Stewart of The Pop Group.